The Loner is #6 of my 30 Paintings in 30 Days Challenge. My personal theme is paintings inspired by quotes and so far I've done all trees because I love them and all the great things about them. 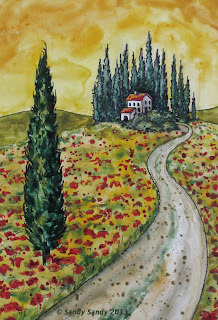 This piece evolved into a "Tuscany Inspired" tree theme through the comments and feedback of friends on facebook. Although I've never been there, or painted it before, I've seen many photos and hear from everyone that it is simply one of the most magnificent places on the planet. It is most definitely on my bucket list! I did a lot of pre-painting planning on this little gem. It kind of came out with a Van Gogh influence, don't you think? How do you think I did with the colors? Thanks to everyone on facebook that helped me with these "Tuscany Colors". Your comments and feedback help me to grow and is most appreciated! Definitely a Van Gogh influence - I love this composition and the colors are bold! Thanks Pattie. Nice to meet another 30/30 painter here! What a beautiful collection of work this project has become. Love the theme. Thanks for stopping by, Carmella! I thought of you and all your gorgeous photos of Italy while I was working on this one. I think "The Loner" would look great in a gold florentine type of frame. What do you think? What a fabulous painting. So perfect with the poem. That house is amazing surrounded by friendly trees. My favorite part of this painting is the sky. This certainly has a strong Tuscany look to it (never been there either, but have seen lots of pictures). Another beautiful work.